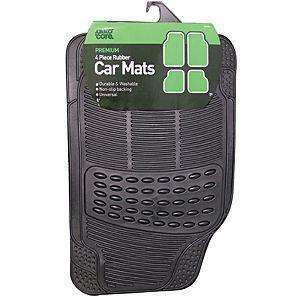 Autocare Premium car mats now only £6 instore at Asda. High quality non slip rubber. Piles of them in Blackpool. These are heavy duty and will last years. Not bad for £1.50 a mat. Never heard premium car mats being made of rubber. Lambswool mats are premium. Never heard premium car mats being made of rubber. Lambswool mats are … Never heard premium car mats being made of rubber. Lambswool mats are premium. Obviously you have never heard of premium RUBBER car mats. Good deal showing as £8 oh website, went into a store today where they were £13 I explained the deal online showedthem on my phone but they said I couldnt do it. So I explained if I go home and press click and collect I could then come back and get it for £8 seems crazy but they said it was there policy is this correct? Good price if you want some cheepy mats, i prefer the car Manufacturers though as they are an exact fit, and since it is a one off buy i dont mind paying £30 odd.